KBShimmer Dressed To Gild (Texture): A gold cousin to Hexy Bikini, this textured polish is rich with holographic gold glitters. Hints of lavender and lime glitters add depth and extra shine. I didn't include individual bottle shots for each shade, but this one really wowed me! My stand out favorite of the collection. Two coats for this jammed packed glitter bomb. Ugh I love how it dries down matte yet incredibly sparkly and the gold with lime and pink? Brilliant. 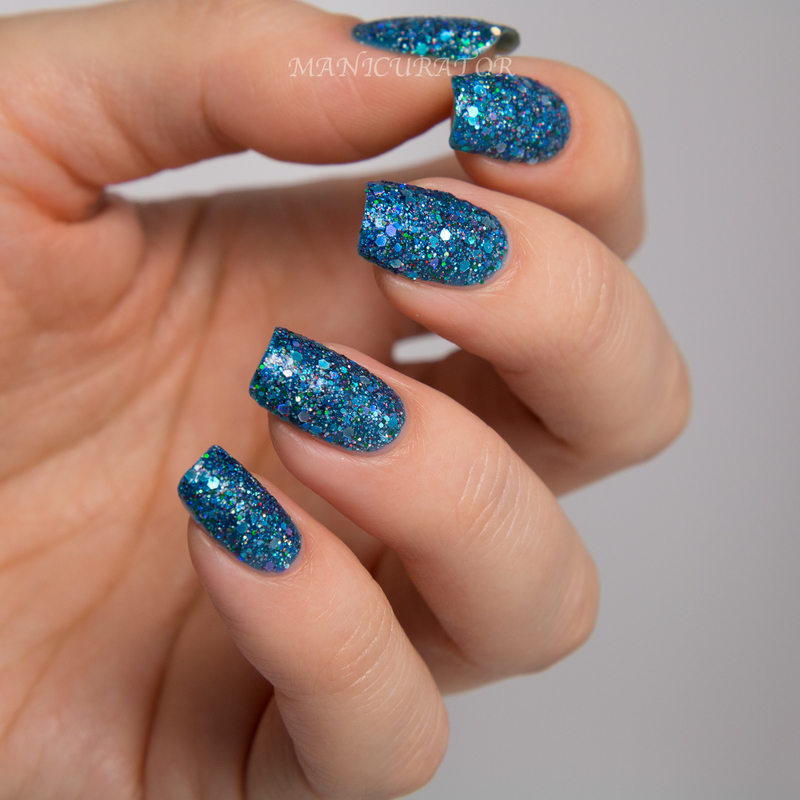 KBShimmer Too Cold To Hold (Texture): A rich sapphire blue base is filled with holographic sliver, blue, and green holographic glitters for a bejeweled textured look. 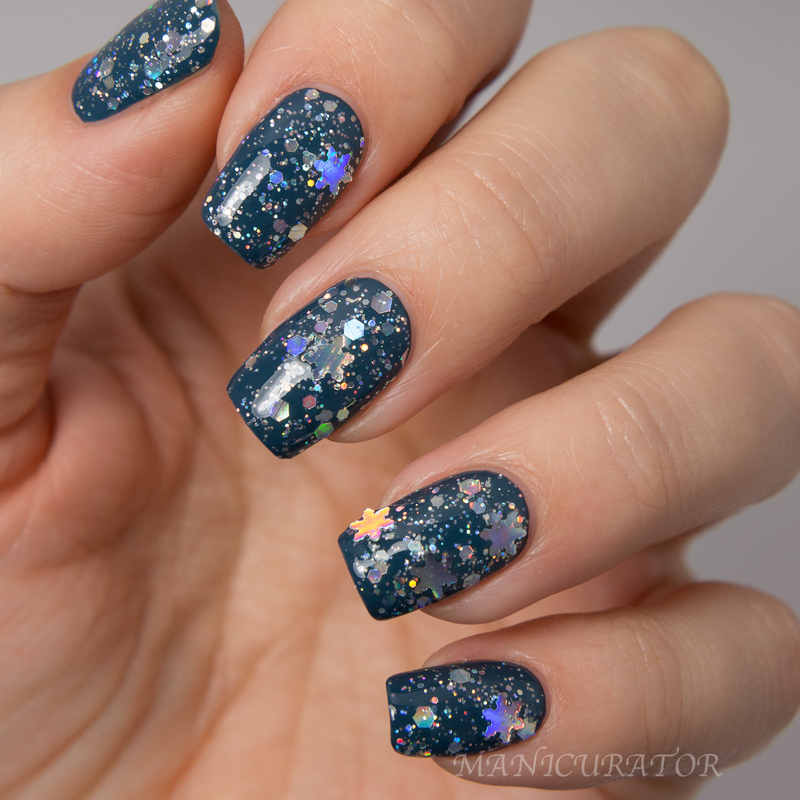 Incredibly beautiful mix of glitters that is full of depth. Excellent formula, 2 coats here. KBShimmer Turnip The Beet (Texture): A rich sangria colored base accents holographic glitters in magenta, purple and red making this a super sparkly textured polish. Another fabulous formula, 2 coats here. Love. Just love. 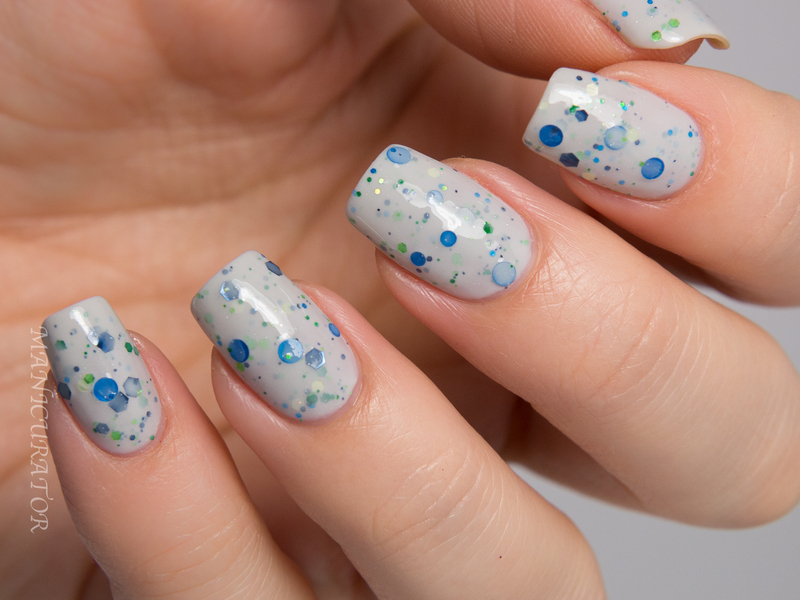 KBShimmer White Here, White Now (Texture): This snowy white polish is a blustery addition to our textured collection. Two coats offer more coverage than any blizzard. Please note, the full textured effect does not show until polish is fully dry. 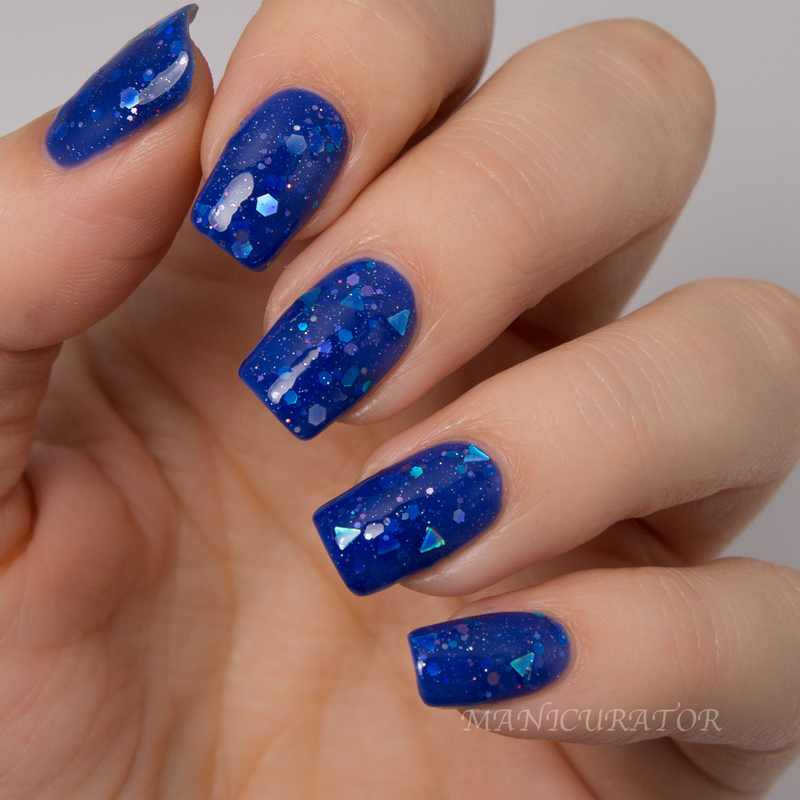 KBShimmer Pine-ing For Yule: 2014 Toys For Tots ® charity polish. A holiday inspired glitter top coat, this polish is swimming with holographic triangle “Christmas Trees” and red star tree toppers. 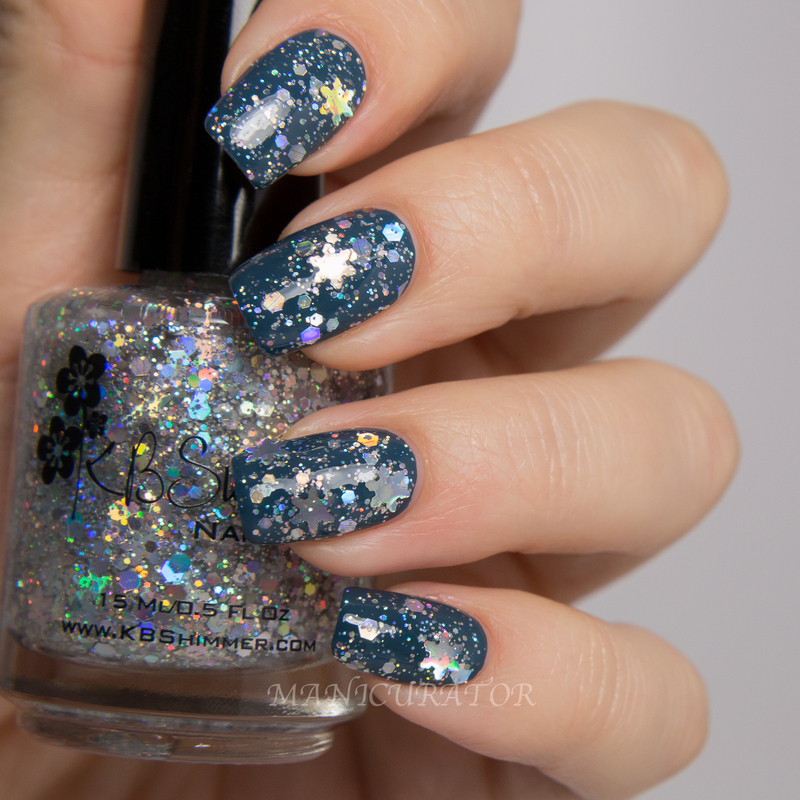 Sliver holo hex and micro glitters complete this wintery polish. For each bottle sold at KBShimmer.com from 11/01 until 12/25 $4 will be donated to Tots For Tots ®. Another totally creative polish and who can resist contributing to such a good cause? I dabbed on 1 coats here over White here, White Now which of course turns that texture shade into a glossy white. KBShimmer Let’s Sleigh Together: A pale gray creally, this muted polish features hex glitters in green, navy and pale mint, circles glitters in blueberry and micro holographic glitters for shine and sparkle. Another winner for me, this is 3 coats and I love how the base isn't stark white. Such a soft glitter polish if that makes sense. KBShimmer Mauve On Over: A pale mauve creally base sets off a explosion of colored hexes in orange, navy and aqua. Again, KBShimmer creates a unique color combo! I love how these colors contrast with each other. Three coats. 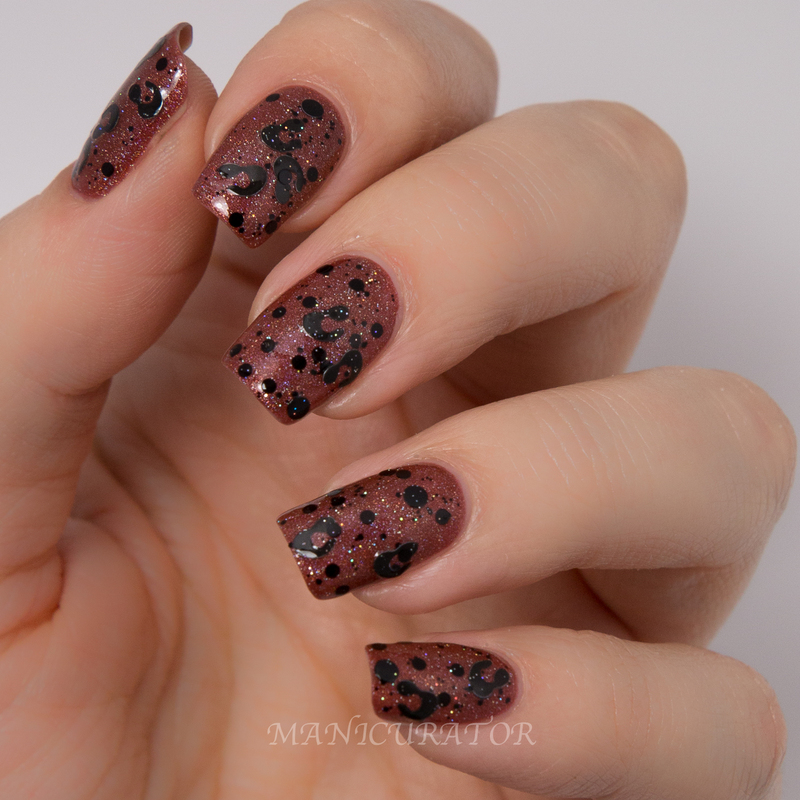 KBShimmer Deja Brew: Like a rich cup of java, or a quality cognac, this brown polish has red undertones that set off the linear holographic rainbow. Anything that reminds me of my beloved coffee is good in my book. Perfect formula, 2 coats. 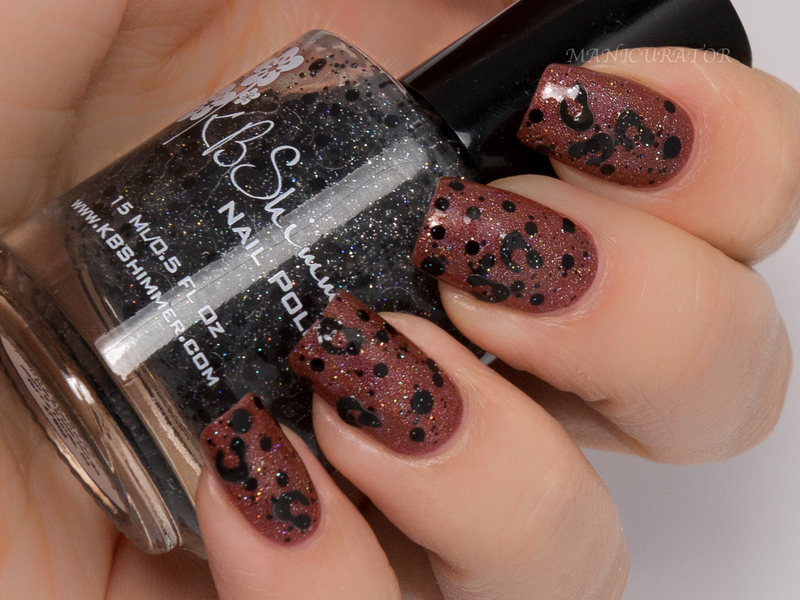 KBShimmer Spot Sign: Like a wild cat ready to pounce, this spotted polish is ready to bring out our wild side. Black leopard spot shaped glitters are accented by black dots, small black hexes and micro holographic sparkle. One coat, dabbed in some spots, over Deja Brew. 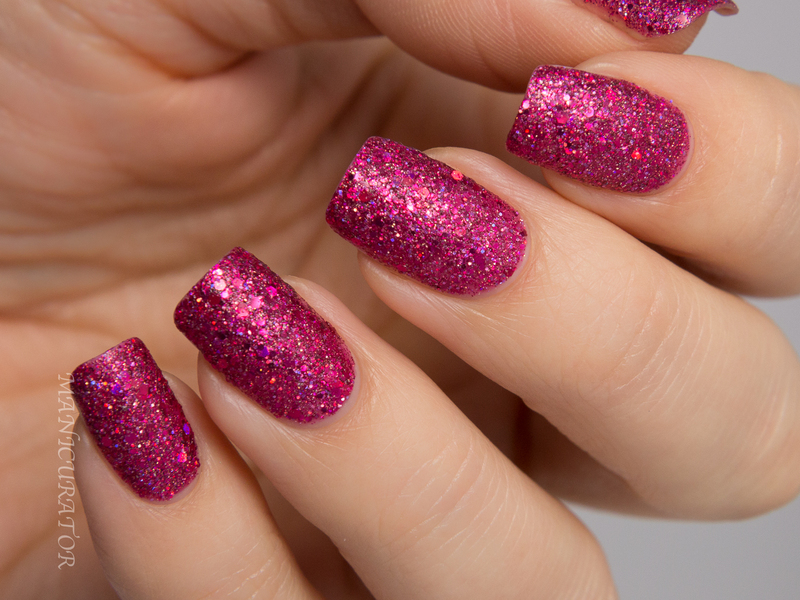 LOVING nail polish glitters that are novel like this! 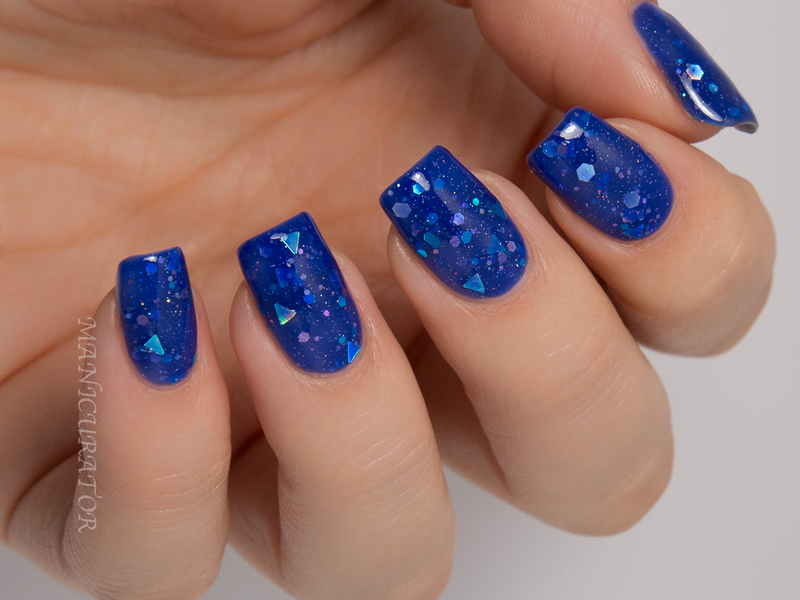 KBShimmer Fallen Angle: A vibrant royal blue jelly, this a-cute polish features holographic blue triangles, silver holo hexes, and blue hex glitters with micro sparkles. Whoah. Just stunning. This polish is full of so much that is right!! First of all, royal blue jelly! Second - great formula full coverage that isn't thick or gloopy for such a pigmented jelly. 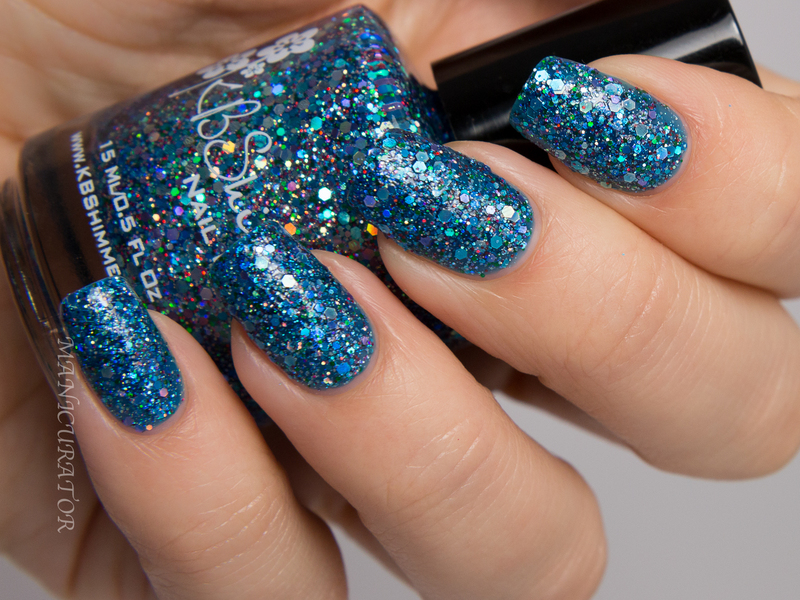 And lastly, holo triangle glitter. KBShimmer Flake Dance: Sliver holographic snowflakes dance among a scattering of smaller silver holographic glitters. Use over your favorite cream color for an instant wintery manicure. 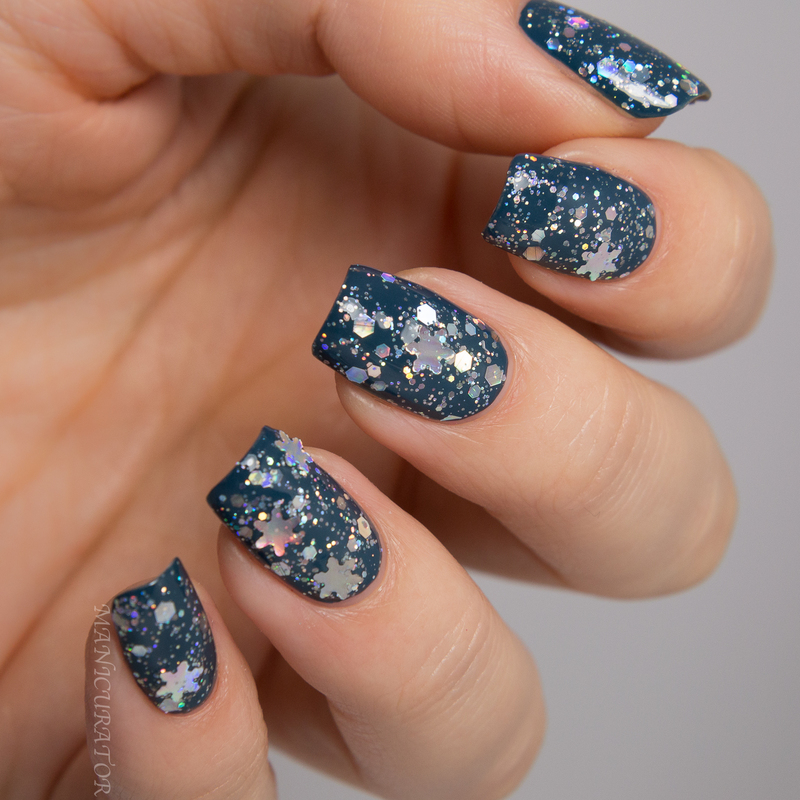 -Sigh- another snowflake polish I'm in love with! This is one coat over one coat of KBShimmer Stonewashed. I really didn't have to do any fishing for glitter. I usually turn the bottle upside for a few minutes before I polish if it's a bottle with larger, heavier glitters. Have you already shopped from this collection? Would love to hear which ones you got or are planning to get! The Winter themed nail vinyls are available now and I can't wait to make a design using them! I couldn't be more thrilled with the new scents for the cuticle oil. I am super picky about my scents and for some reason neither the pink sugar or lemongrass agreed with me. I adore the chai tea and raspberry vanilla. The peppermint is great and unscented, well you can't go wrong with that. I have one of these in my bag, in my car, in my night table, in the kitchen everything drawer. You get the idea. Perfect on the go not messy cuticle oil! Free shipping for all orders over $40 on kbshimmer.com 11/1/14-12/31/14 (no code needed). Free polish, Holly Back Girl, with a $70+ purchase (See wondrouslypolished.com for great swatches of this one). Use code HBGFREE to receive free polish and free shipping with $70+ purchase from 11/01-12/31. While supplies last, free samples will be sent out with each other. Free snowman glitter pack to the first 400 orders! Nail vinyl sheets are $5.00, nail polish $8.75 available at www.HarlowandCo.org and www.KBShimmer.com. I love this collection...and your swatches are just beautiful! These are so gorgeous! What a lovely collection. Gorgeous swatches of a gorgeous collection!! Love your swatches! I didn't know it was possible for your photos to get better, but I think they have! These colors are all so gorgeous. I need them all! ooh! i ordered some of these polishes. can't wait to try them out ! I really like Fallen Angle. Yes, it's something special for sure! Aren't they? Did you end up getting any? Thank you so much! I've been putting a lot of time in, learning all the manual settings! Oh Vic, it's even more spectacular in person! Thanks so much sweetie! I've been working hard at it! Thank you so much and I agree, the collection is wonderful! These are SO gorgeous! KBShimmer just doesn't stop impressing me. Your swatches are perfect! One of the best collections I've seen yet. They're all so rich looking. Want them all!